Over 50 participate in Spartan Mile race. Over 50 participate in Spartan Mile race. 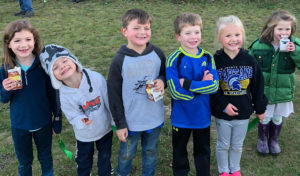 SCOTTVILLE — Over 50 Mason County Central elementary students participated in the Spartan Mile race Wednesday evening at Riverside Park. The event, for students in kindergarten through fifth grade, was sponsored by the varsity cross country team. Participants received chocolate milk, a slap bracelet, a ribbon, and a MCC cross country wristband. Medals were awarded to the top three boys and top three girls in each grade. “It was a beautiful evening for a run and we are very thankful to all those who participated and those who helped organize the event,” said Ed Sanders, head cross country coach.